Wall Street is worried about a lot of things with AT&T's proposed buyout of Time Warner. Ma Bell might be paying too much. Regulators could shoot down the deal. There may not be many, if any, cost-cutting opportunities for AT&T (T). The lack of overlap is a reason why the deal might not be too bad for Time Warner employees -- includng CNN staffers like me. But Wall Street hates the fact that there won't be huge savings that can boost earnings. Still, there is one thing investors don't seem too nervous about. They don't appear to believe a deal could be as much of a headache as the ill-fated marriage between AOL and Time Warner, which was announced back in 2000. The topic of AOL didn't even come up on Monday's analyst call. You'd think at least one Wall Street analyst would ask AT&T to explain why the Time Warner merger is not another disaster waiting to happen. The AOL Time Warner deal is now a textbook case of a merger gone wrong. AOL and Time Warner combined at the height of what we now know was a speculative mania for tech stocks, especially Internet companies. It was also the end of AOL's glory years in general. As internet access became more readily available from cable and telephone companies -- like AT&T and its Baby Bell offspring -- there wasn't a need for people to pay to have their hands held when going online in the walled garden that was AOL. AOL became obsolete in a world that quickly got taken over by Google and Facebook. That's where all the online ad dollars went. So Time Warner (TWX) inherited an asset in decline. And the plan to marry AOL with Time Warner's cable unit -- which also offered internet access -- never really panned out. That's why AOL Time Warner eventually unraveled. AOL was surgically removed through a spin-off -- and ultimately was bought by Verizon (VZ). Time Warner Cable was also spun off -- and is now part of Charter Communications (CHTR). Magazine publisher Time Inc. (TIME) is now its own separate entity too. But AT&T isn't buying any of that excess baggage. It is simply inheriting content -- and a lot of it. CNN. HBO. Warner Bros. DC Comics. TBS and TNT. Bleacher Report. There already is precedent for a supplier of pipes scooping up a company that stuffs said pipes. Comcast owns NBCUniversal. And that's a deal that has paid off handsomely for Comcast. Shares of Comcast (CMCSA) have outperformed the S&P 500, AT&T and Time Warner over the past five years -- as well as over the past decade. Comcast just made a bigger bet on media and entertainment as well with the purchase of DreamWorks Animation. Will AT&T-Time Warner wind up being as successful as Comcast? That remains to be seen. There are legitimate worries about the mountain of debt that AT&T will have once the deal closes too. But AT&T isn't exactly forging a new path with the Time Warner deal. In addition to Comcast's NBC purchase, Verizon has already dipped its toe in the content world with AOL and hopes to get even bigger with the purchase of Yahoo's core assets. 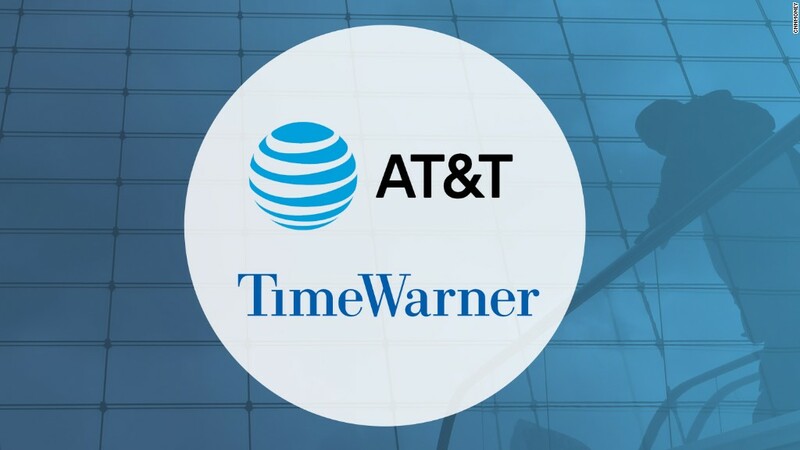 CFRA Research analyst Tuna Amobi noted Monday that Time Warner will bring AT&T more diversification away from the commodity businesses that it currently plays in -- wireless phone plans, broadband access and cable TV. Here's another reason why this might be different than the AOL deal. Having AT&T as a parent should make Time Warner less susceptible (and not more) to the cyclical nature of the media business. If the U.S. economy slows -- which some fear it might if the Federal Reserve starts raising rates later this year and next -- then pure media companies could be hurt. Ad dollars will shrink. But AT&T's slow and steady telecom business should hold up better, which would be good for Time Warner, according to UBS analyst Doug Mitchelson. "The backing of AT&T's more recession resilient communications businesses and the sheer size of its cash flows should allow Time Warner to sustain content investment when competitors might have to cut costs," Mitchelson wrote in a report. Sure, I may be talking my own book here, so to speak. I'm an employee (and shareholder) of Time Warner. I also have the proverbial 20-20 benefit of hindsight. But the impending AT&T purchase seems more inevitable and necessary than the AOL-Time Warner merger ever did. Sure, there are lots of questions. But AT&T is simply following the lead of its rivals. That's why this doesn't look like this is AOL 2.0. Besides, former AOL chief Steve Case and AT&T CEO Randall Stephenson look nothing alike.